Looking for a new, unique, and desireable gift? Then give the Gift of Ski for any Occasion! 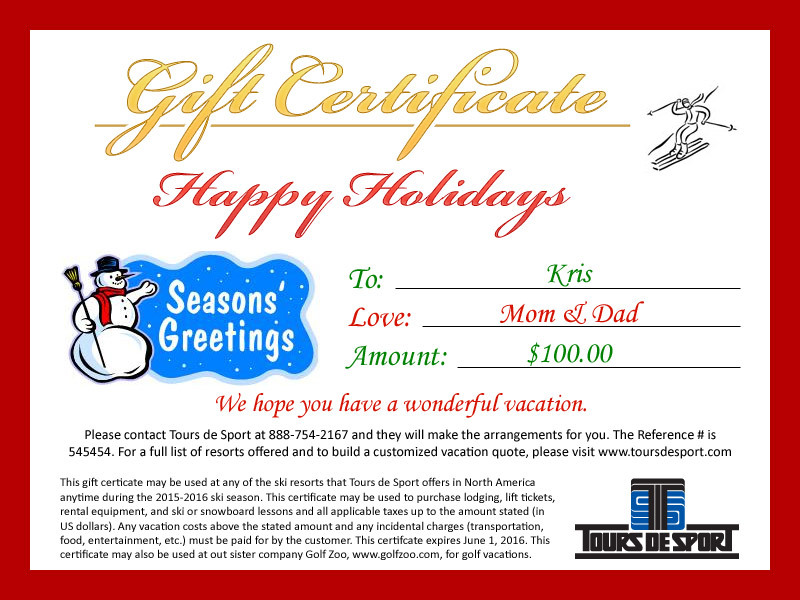 If you are searching for the perfect gift for that special skier or snowboarder on your list - Tours de Sport designs Gift Certificates for any amount and to any destination that we offer! The recipient can still do the planning of their trip if you choose. And our Gift Certificates are good for any occasion too - Happy Anniversary, Happy Birthday, Congrats on your Retirement, A Very Merry Christmas, or just because it's Friday - Call us today and ask about them! Call us now at 1-888-754-2167 to get your gift certificate!